Stylist + Creative Director, Kendra Y. Hill has been featured in numerous media outlets throughout her career. Here are some of the most recent clippings. Kendra was featured in Voyage Dallas online. She discusses her journey to becoming a stylist and some helpful tips for those just getting started. Kendra wrote an article for Queen B Magazine on empowering yourself as an entrepreneur through your image. She shares 4 tips on dressing and looking your best as a boss! June 14, 2017 - The most recent styling by Kendra for JustFab is live! This month's focus was dressing for summer events. 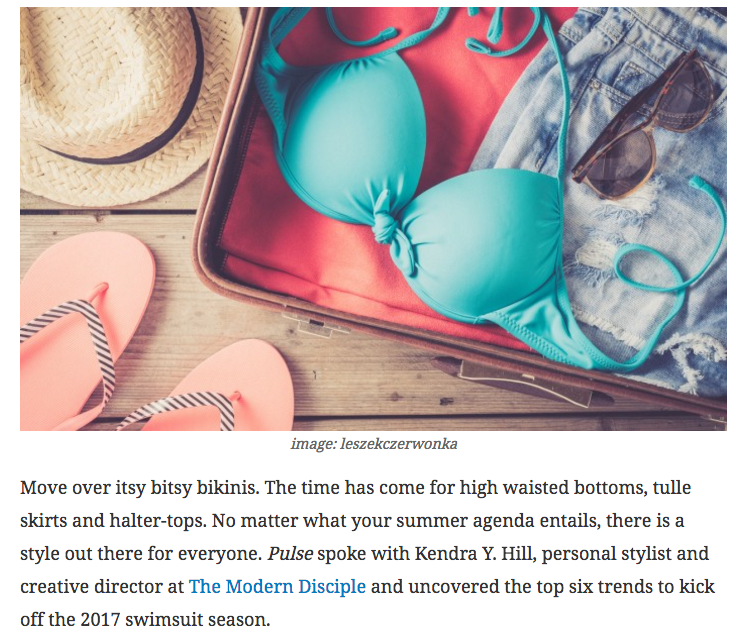 MAY 12, 2017 - Kendra shares her top 6 trends for the 2017 swimwear season with Long Island Pulse, including high waist, ballet and retro suits. MAY 1, 2017 - Kendra was featured on the cover with a 3 page spread in Bold Favor Magazine. She discussed taking the plunge into the fashion industry, balancing work and personal life as well as how she got her start. Kendra is quoted for How Stuff Works in an article about dressing tall women. Kendra wrote an article for K.I.S.H. Magazine on pursuing your dreams. She shares the story of jumping into the fashion industry feet first against all opposition.